Commercial real estate activity in the Lower Mainland declined from the record highs of one year ago and returned to more historically typical levels in the second quarter (Q2) of 2017. 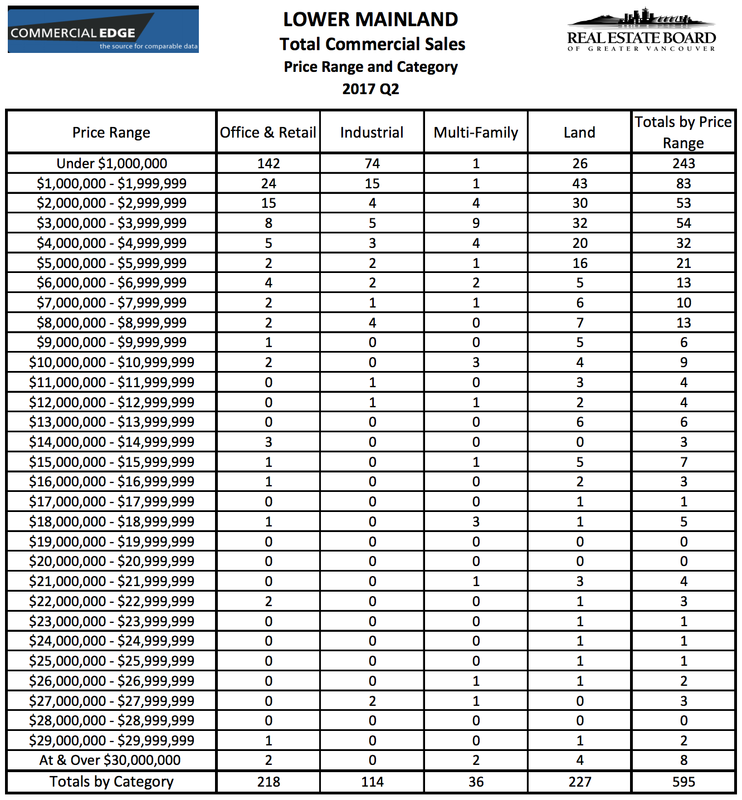 The total dollar value of commercial real estate sales in the Lower Mainland was $2.886 billion in Q2 2017, a 37.5 per cent decrease from $4.615 billion in Q2 2016. Land: There were 227 commercial land sales in Q2 2017, which is a 39.3 per cent decrease from the 374 land sales in Q2 2016. The dollar value of land sales was $1.510 billion in Q2 2017, a28.6 per cent decrease from $2.116 billion in Q2 2016. Office and Retail: There were 218 office and retail sales in the Lower Mainland in Q2 2017, which is down 23.2 per cent from the 284 sales in Q2 2016. The dollar value of office and retail sales was $0.775 billion in Q2 2017, a 57.7 per cent decrease from $1.835 billion in Q2 2016. Industrial: There were 114 industrial land sales in the Lower Mainland in Q2 2017, which is down 34.9 per cent over the 175 sales in Q2 2016. The dollar value of industrial sales was$0.243 billion in Q2 2017, a 13.3 per cent decrease from $0.280 billion in Q2 2016. Multi-Family: There were 36 multi-family land sales in the Lower Mainland in Q2 2017, which is down 14.3 per cent over the 42 sales in Q2 2016. The dollar value of multi-family sales was$0.358 billion in Q2 2017, a 6.8 per cent decrease from $0.384 billion in Q2 2016.